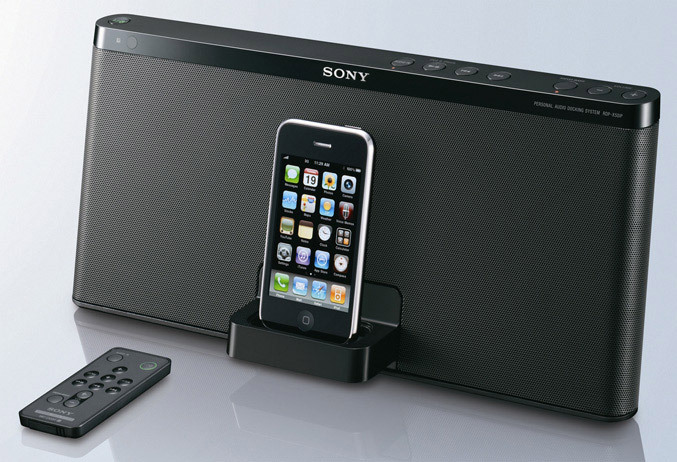 Sony extends its speaker docks for the Apple’s iPod and iPhone with the new RDP-X50iP model, which resembles the RDP-XF100iP and RDP-X80iP models and has pretty same features in compact, minimalist design. The RDP-X50iP has measures of 356 × 158.1 × 151.9 mm (W x H x D) and weights approx. 1.8 kg, it packs digital amplifier capable to deliver 20W + 20W output RMS, has two 3-inch bass reflex speaker design, that promise “rich and powerful bass”, “clear midrange and crisp high frequency reproduction”. The system comes with various pre-set modes for different styles of music, like (Rock/Pop/Jazz/Vocal/Flat), tere’s also a standard 30-pin dock connector for connecting to and charge all iPhone or iPod, a 3.5-mm auxiliary input and omnidirectional infra-red remote for the usual controls.